The fire of July 6, 1923 completely destroyed the Main St. area, a total of about 25 blocks. The fire started in the house of T. C. Rea, immediately south of the Brown Parker Garage at 6:40 a.m. It is generally believed a liquor still in Rea’s house had exploded. 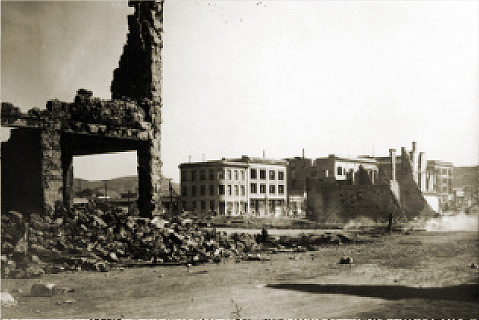 The Fire Chief, I. N. Galliac, believed it was the result of a bootleggers feud. Two lives were lost during the fire. One was John Duryer, janitor at the National Hotel (formerly known as the First National Bank Building). Mr. Duryer was last seen alive on the roof of the hotel. The second victim was David D. McArthur, a shoemaker located at the intersection of North Main and Broadway. Mr. McArthur died of a heart attack while watching helplessly as his store burned. 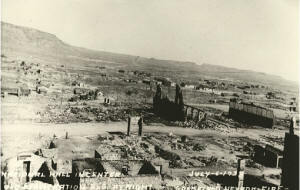 Another devastating fire, was the fire of September 29, 1924, that destroyed the Goldfield News Building and the Montezuma Club, pictured at right. Goldfield, Nevada, once a busy bustling town which commanded so much political and economic power throughout the state, today, is but a whisper of its former self. the great town that it once was.